The Belleville Sabre Hot Weather 633's are ready for use in any arduous environment.These U.S. military combat boots are 1 of proud line of Belleville boots & certified as genuine military boots. With a lower sole for added mobility, cool mesh lining for a cooler more comfortable fit, these boots beat the competition, and will last! They are true duty boots of the Belleville military line. As uniform boots go, you will find the Belleville boot to create a standard of military footwear. 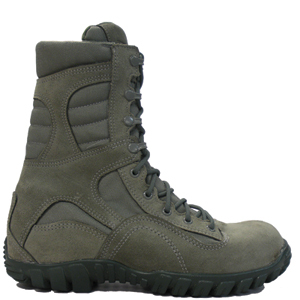 There simply is not such thing as cheap military boots from Belleville only affordable ones.